With equities seemingly having put in a cycle floor of sp'1992...the VIX is starting to cool, settling -8.6% @ 19.31. Near term outlook offers broad 'melt lower' to the mid/low teens. 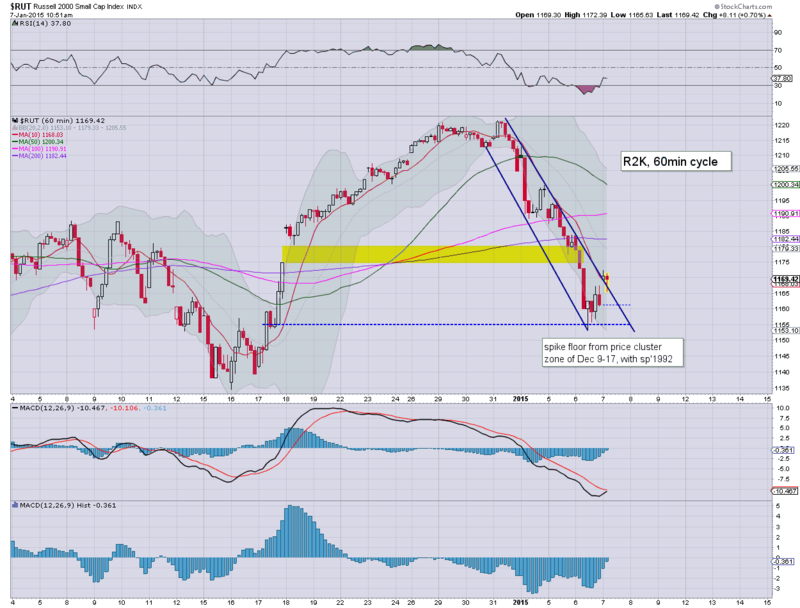 If the market is in a much better mood by end January.. the 12/11s look viable. Equities look floored... VIX should merely continue to fall into the coming weekend... if not the next few weeks. 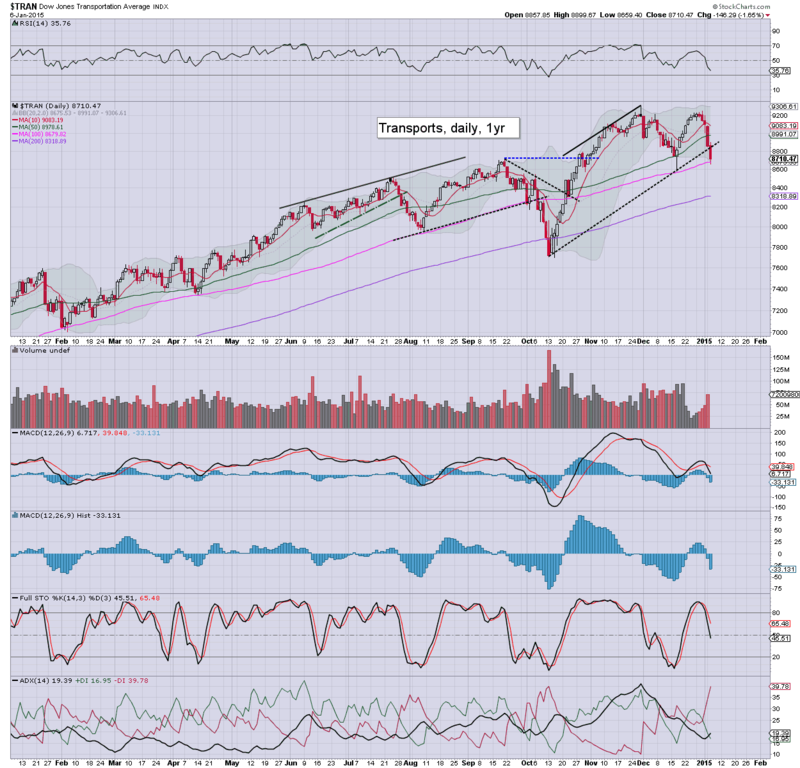 US equity indexes battled hard to hold somewhat significant net daily gains, sp +23pts @ 2025. The two leaders - Trans/R2K, settled higher by 0.7% and 1.3% respectively. Near term outlook is offering upside into the weekend. With a rather clear spike floor of sp'1992, the door to 1972/1960 appears to have closed. An interesting day.. and certainly... the down cycle from sp'2093 appears to have concluded. Now its a case of how high... and how quickly. I'm well aware a fair few (not just the usual suspects) are seeking a move into the sp'2100s.. before a more significant down wave. Yet... why would the next down wave break any lower? Broadly speaking, it remains a near relentless series of higher highs... and higher lows. On a day when maniacs were shooting artists in France... I'll end with this bearish update... from Washington D.C.
Suffice to say... 5 consecutive net daily declines... and we're back to normal service. Next big data point is the Friday jobs data... that will surely come in 'fine'... and be an excuse for a weekly close somewhere close to break even (sp'2058). Notable strength: AA +2.1% (earnings next Tuesday)... one of my 'holy trinity for 2015'. 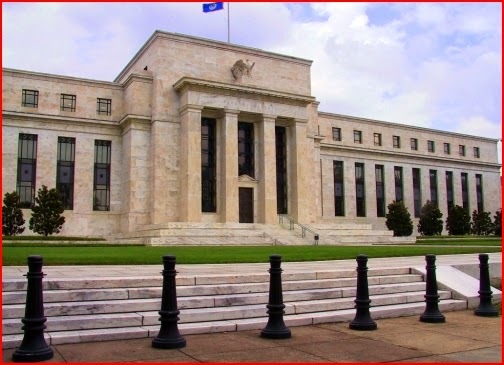 Its time for the first fed press release of the year, the minutes of the Dec' FOMC meeting. No doubt, the algo-bots will be looking for an excuse to wash out another tranche of short-stops this afternoon. A daily close in the sp'2025/35 range looks likely.. along with VIX 19/18s. Despite what some might say... we have a clear break of down trend... and we're importantly holding the sp'2020s. 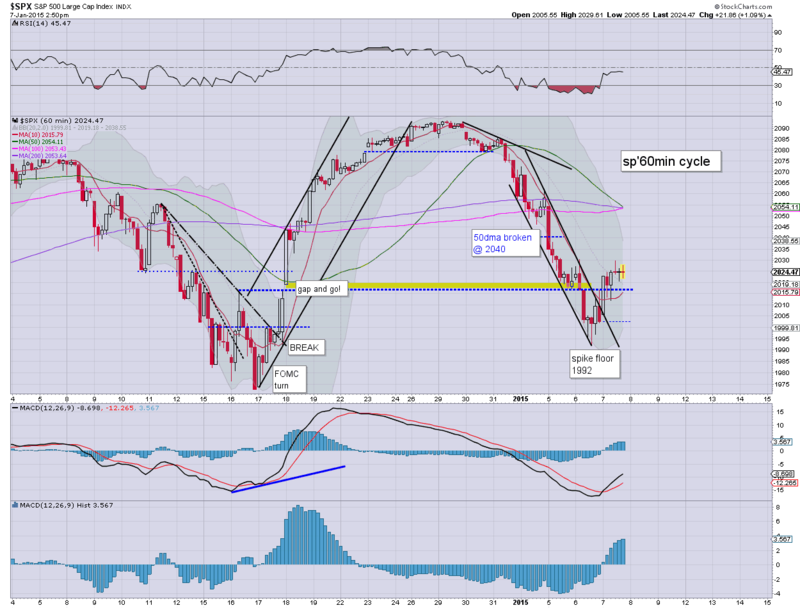 A daily close in the 2030s would merely be a bonus.. and set up 2045/55 before the weekend. Notable strength: F, +2.8%, perhaps on the notion of higher vehicle sales.. as consumers have more spare cash. weakness: TWTR, -2.5%.. after yesterdays strong gain. 2.04pm.. Market a touch twitchy... but starting to pick up again... new highs look due... even in the laggy R2K. VIX set for a close in the 18s. It should pretty much clarify the rest of the week. Despite some continued mild concern, US equities are holding moderate gains. Price structure is offering a baby bull flag on the micro 5/15min trading cycles. 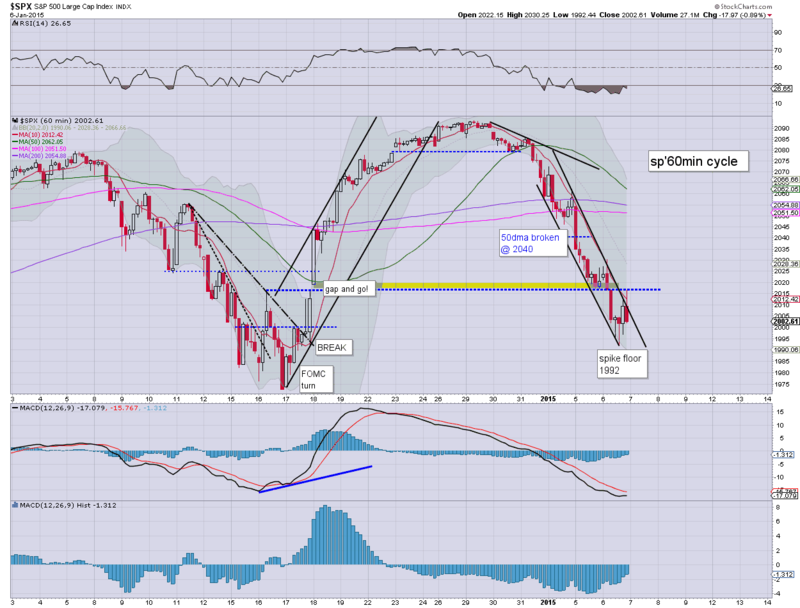 There is viable upside to the sp'2035/45 zone by Friday. 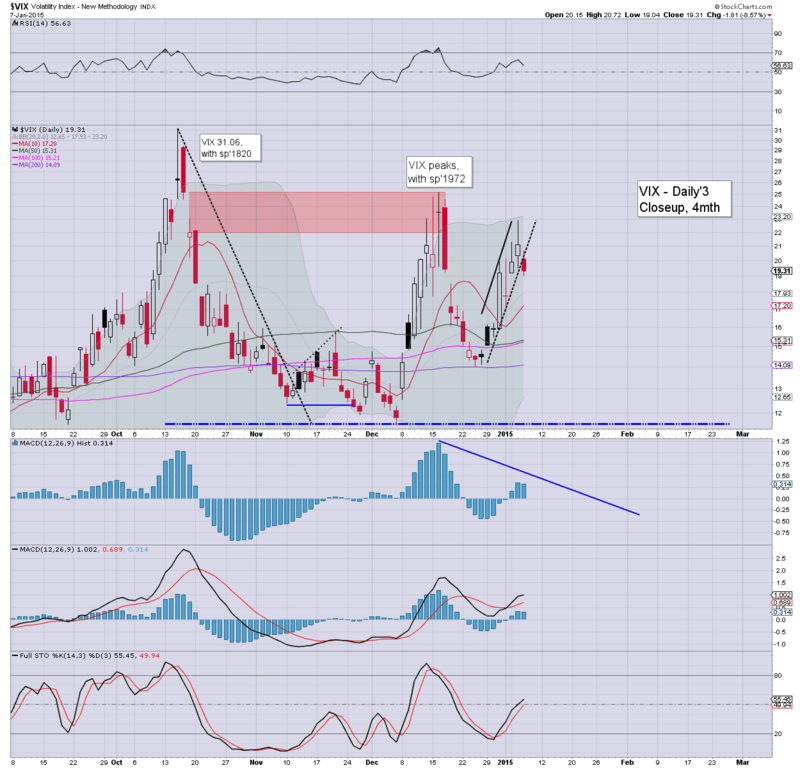 VIX is -5% @ 20.00, a daily close in the 19/18s looks probable. *FOMC minutes due at 2pm. Should offer an excuse for market to push another wave higher, if the mainstream decide that interest rates won't be raised until at least the second half. So.. we're still net higher. No doubt, some will be calling today a bounce, but yesterday's price action is offering a rather clear spike floor of sp'1992. 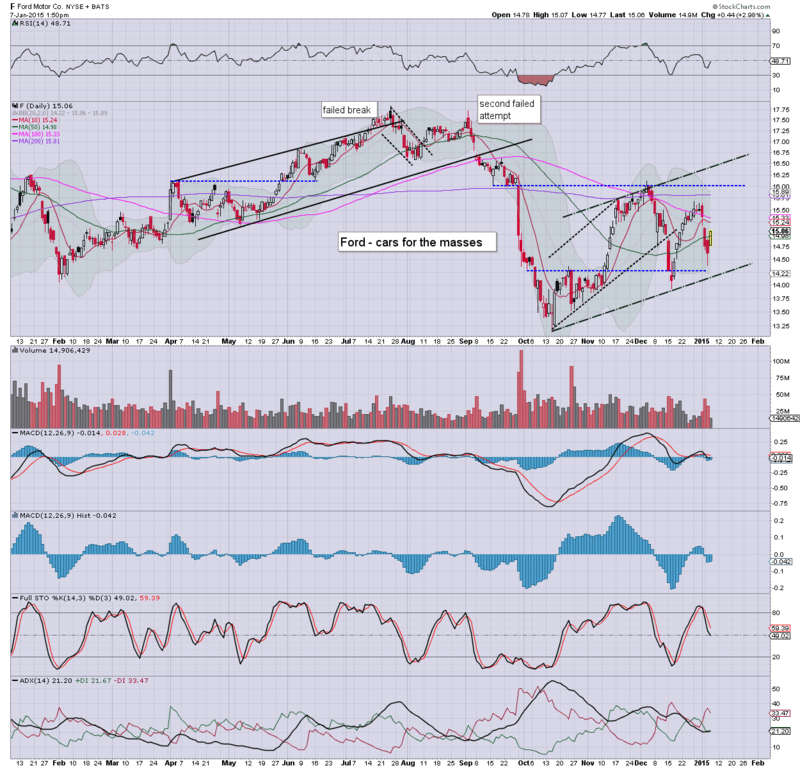 All things considered... a brief hit of the Dec' low of 1972... or the 200dma of 1960.. now look out of range. US equities see a minor down wave from the early high of sp'2024 to 2013. Without question though.. the down trend has been broken. Metals remain weak, Gold -$4. Oil has lost half of the opening gains, +0.9%. VIX remains a little lower, -4% in the low 20s. *the R2K is notably weaker this morning... almost turning red just earlier. A close in the 1170s will be kinda important. Unlike yesterday... the price action is at least somewhat more bullish... and as noted... the down trend has been broken. A sixth consecutive net daily decline looks VERY unlikely. *FOMC minutes/press release at 2pm... that will no doubt give the algo-bots something to process. US equities open higher, with the short term down trends decisively broken. First upside target is the 50dma of sp'2040.. along with a VIX back in the 18s. Metals are cooling, Gold -$7. Oil is battling upward, +2.1%. So... we're almost 1% higher on most indexes, and we have a bullish MACD cross on the hourly cycle. 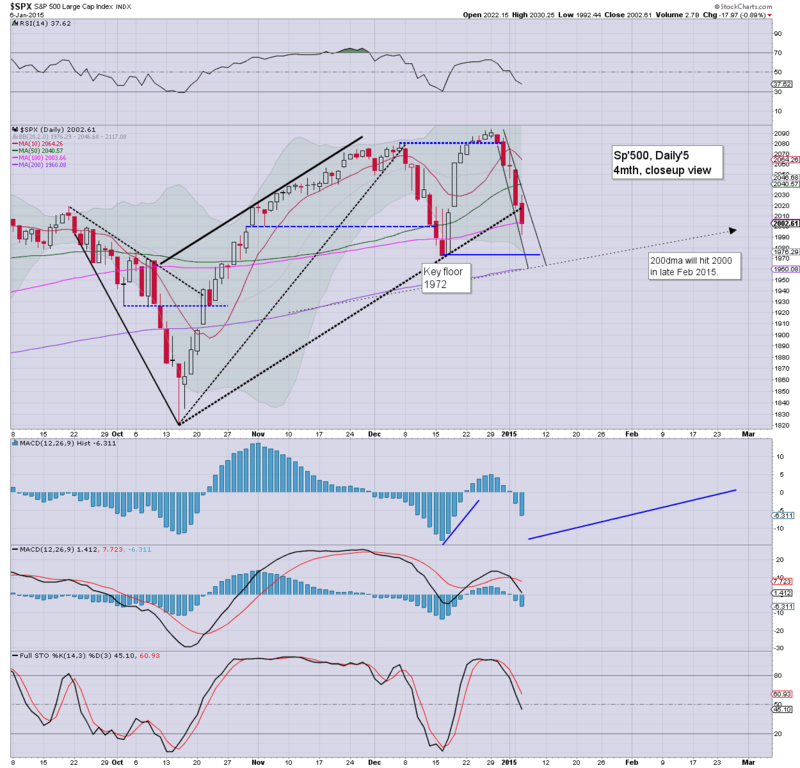 Could be the start of another major wave to new highs... the sp'2100s remain viable by end month. Notable early gains, JCP +21% (not a typo.... no doubt a huge number of bears having to closeout), M +2.6%.. as retail catches some serious buying interest. Good morning. Futures are borderline significantly higher, sp +17pts, we're set to open at 2019. Metals are cooling, Gold -$10. Oil is bouncing, +1.7%. We're set to break back above the important hourly 10MA at the open, and that does offer an initial confirmation that sp'1992 was a key spike floor. First key target for the bull maniacs though will be to re-take the 50dma, but that is a fair way higher around 2040... clearly.... some days away. Update from a resolutely bullish Mr C.
ADP jobs: 241k, slightly above expectations, and that is helping Mr Market look ahead to the big Friday monthly jobs data. Across the last few years, so many have touted the 'terrible and failed' monetary policy of the US Federal reserve (along with other central banks)... yet here we are....in early 2015... and those very same people are now furiously supportive of the very policies for which they once relentlessly despised. Today was a particularly interesting day in market land. Whether this afternoon was a cycle capitulation low of sp'1992 - along with R2K 1153.. and VIX 22.90.. . frankly... its not that important in my view. We've seen hundreds of such down waves across the last few years... only to be followed by equally strong up waves. Indeed, the last two counter rallies have been especially powerful... each time, breaking a new historic high.. even in the R2K. Across the last few years I've noticed a great many quirky and strange things. Lately, one thing has really started to stand out... that of how many of the original 'free marketeers', doomers... or whatever you want to call them.. are now supportive of what is essentially Federal reserve policy. First, we have the issue of falling Oil prices. Just a few years ago... everyone - not least those in doomville, would have been delighted with Oil in the $40s. Not anymore though... ohh hell no... low prices are now seen as bad! After all.. the 'deflation monster' will kill us all... right? Then there is the issue of low interest rates. So many would often slate the Fed for its periodic meddling in trying to determine market interest rates. Now, those very same people are touting that higher rates - even a few percent.. would cause terrible problems.. and thus... 'market forces' should not be allowed to happen. The third issue of QE is somewhat arguable, but many - not least those in the mainstream, are desperately clamouring for the ECB to start buying EU govt. bonds. Yet, whether that happens this year seems to be of little importance. After all... the same argument was had in 2012, 13... and 2014. Despite no such bond buying, most of the EU equity markets have managed to climb broadly higher since summer 2012. It would seem highly likely that more and more people will eventually join the Fed cheerleading squad. Hell, just consider the maniacs on Zerohedge.. they sure are upset that Oil prices have fallen. They have quite literally embraced the mantra of the 'deflation monster' - that low prices are bad for the US and world economy. What would any of the Tylers (there are dozens from what I gather) say if asked 'So.... you now consider low oil prices are a bad thing.... but.. weren't you screaming 'economic doom' when Oil was $110 in summer 2013. What is the 'right price' to avoid the 'end of the world' ? I would not expect an answer. After all.... continuing claims of 'imminent financial system collapse' or 'equity market bloodbath' gets the site traffic.. and to them.. that is ALL that matters these days. Wednesday will be pretty busy... with ADP jobs data, intl. trade, and the FOMC minutes (2pm). ps. if you don't get the analogy of Shield/Hydra... then you're just not watching the right movies/TV shows. US equity indexes broke new cycle lows of sp'1992 with R2K 1153. 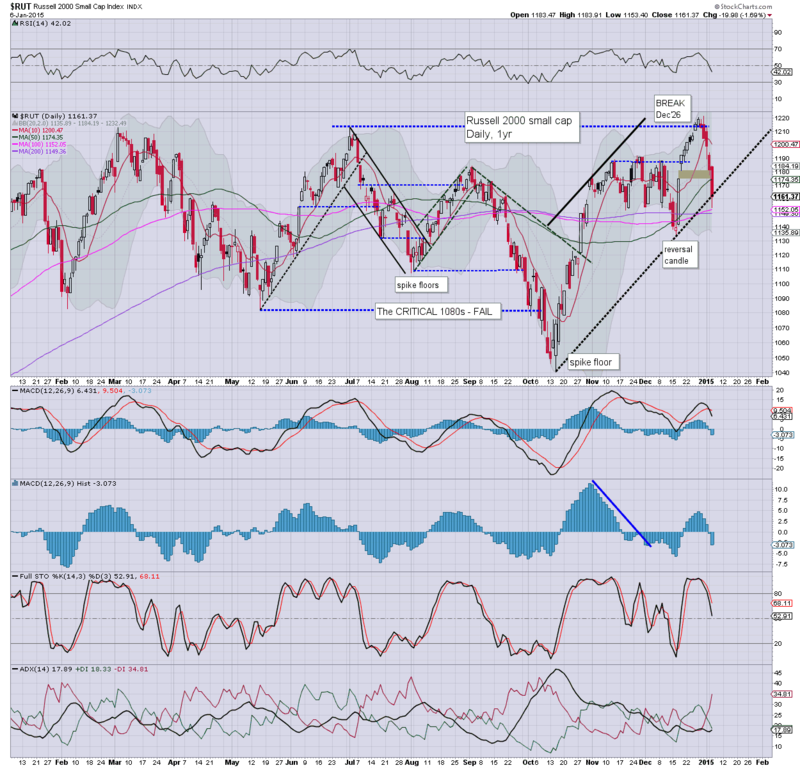 However, there was something of a late day rally, with the sp'500 closing -18pts @ 2002. The two leaders - Trans/R2K, settled lower by -1.6% and -1.7% respectively. Near term outlook offers the bears a few more days... but a major swing higher is coming. Suffice to say... the fifth consecutive down day for most indexes...with a notable break of gap support of sp'2017. Clearly, the equity bears are in control of the immediate term... but these down cycles never last forever.